The great part about INSIDER is that we are constantly evolving and adding new features. We are excited to announce the addition of a new enhancement to Filtering 2.0. You can now filter and sort units by the percentage of public/private land. 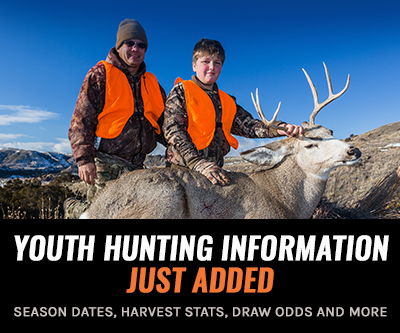 We’ve always listed the percent of private land on individual unit profiles, but this new step makes finding and researching hunting opportunities even easier. This new filter is a huge benefit for researching units. Especially when you’re looking to find that perfect over-the-counter spot or you’re trying to decide how to use your precious bonus or preference points. Once logged into INSIDER, go to Filtering 2.0 and select a state and species. The real power of this new filter is found on the right hand side toolbar after Trophy Potential, Draw Odds, and Seasons. You’ll also notice the percentage of public land is now listed to the right of “Trophy Potential” and “M:F Ratio” in the results section. Adjust the slider and you’ll see the filter go to work and eliminate units with higher amounts of private land. 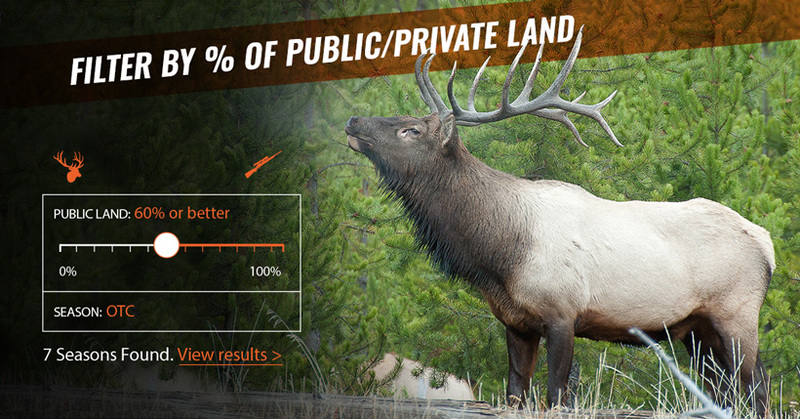 The new Public Land filter works with every state, species and unit. There are plenty of ways to use the filters on Filtering 2.0. This new Public Land filter is a game changer. If you just want to filter all of the units in the state by Public Land, you can scroll down to the Public Land filter and move the percentage up and down. Or if you really want to hone in on a few units, you could go with this in-depth method below. 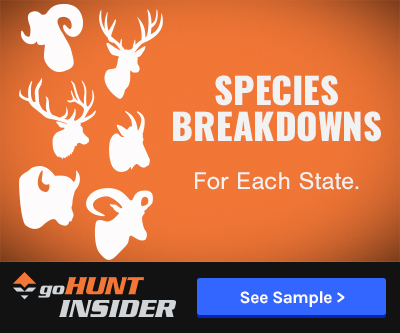 Start out by selecting a state and species. Then in the Harvest Success filter, move the slider to a desired percentage. Then in the Public Land filter, move the slider to a desired percentage. Lastly, don’t forget about the Sort option. Click the box that says Default, and then select “Public Land %.” This will now sort your results from the highest amount of public land to the lowest. You can jump directly to the search results here. In summary, we now took a giant state like Colorado and with five different filters, we narrowed it down from 183 results to 7 results. We can now compare units in Filtering 2.0, or start to dive into each unit profile to further help decide what OTC unit we want to hunt. Not an INSIDER and want to use this tool? Step two: Dive in and have a better season. 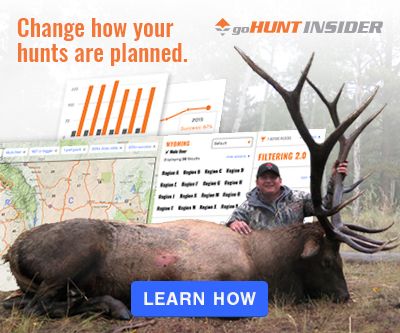 Let us know your thoughts on the new Public Land filtering tool. As always, hunting research is very addicting. And it's always our goal to keep expanding and offering more and more to our INSIDERs so you can be more successful in the field. Thanks, Dru! What you're talking about is something we have discussed. We do love the % wilderness and ability to save information. Thanks for the suggestions. We love hearing what all the INSIDER members want to see and do mark them all down to discuss what we can pull off. Hope you have a great day. I would love to see a way to "save" units within my profile, such as by starring them or adding them to a favorites list, so that the next time I log in and continue to narrow down my search for the perfect unit I can pick up again right where I left off. Would also suggest that you add a feature for % of wilderness/unit for WY. Thad, glad you like it. Keep the suggestions coming. We might not be able to pull it off right away, but it goes on the list. This is a great add-on. I'm curious if you will ever get to the point where you will incorporate public/private lands into the map portion. How about a map where you could put waypoints and basically use it as your scouting map as well, all integrated into one site. I realize others have this feature. Maybe with being able to research and scout on this one site along with the data integration, and then actually export those waypoints out into a .KMZ or .KML file, and upload into Google Earth or another mapping app. This is an awesome new feature guys. Thanks for listening and adding this to the filtering tools!! !